Scope of Analysis in Query Panel can retrieve extra data from the database to give more details on the results for each object in the Query. This extra data will remains available in the Data cube. I heard people having different understanding about Scope of Analysis function in SAP Business Objects report and let’s see what exactly it means. 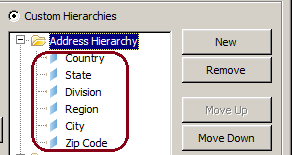 Let say I have Address hierarchy in universe (Country -> State -> Division -> Region -> City -> Zip Code) and these hierarchies can be used in report for Drilling. Scope Analysis option available in Webi / Deski Reports query panel and it allows you to set the scope at query time. 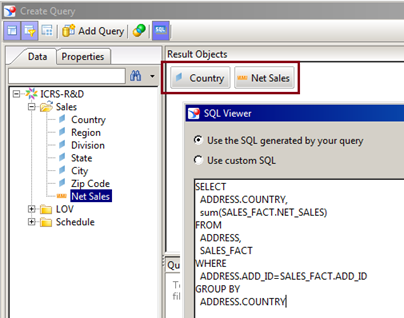 For example, I have selected Country and Net Sales in my Query and SQL for query will looks as below. Report would display the data as below. 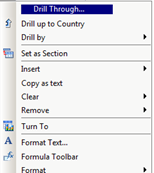 Let’s enable drill option to do Drill through the Address Hierarchy from Country to Region and the result as below. Now Webi report brought Region object into the query without adding the object in the query panel and you can do same way for Division, State, City and Zip code to drill down in report. Each time you drill next level; report will hit the database and bring the respective object data. To avoid each time Database access in the report, will use Scope of analysis and see how it is behaving in your report. Note: Scope of analysis by default is set to none in Query panel. I will enable scope of analysis and from drop down I selected “One level”. Now report will brought Region object in scope of analysis and query. Region object is one level after Country object but there is no change in result objects pane and it will remain Country and Net Sales. Run the report and your report will have Region object and even we have not selected that object in the query panel select section and it will be available in your report for drag & drop analysis. 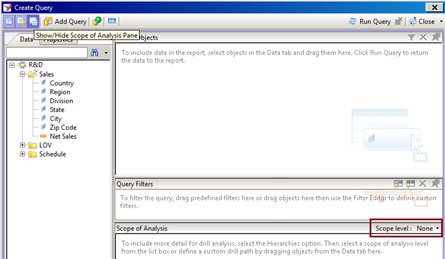 Note: Scope of Analysis option in the Query Panel is only available for relational universes and not for OLAP sources. 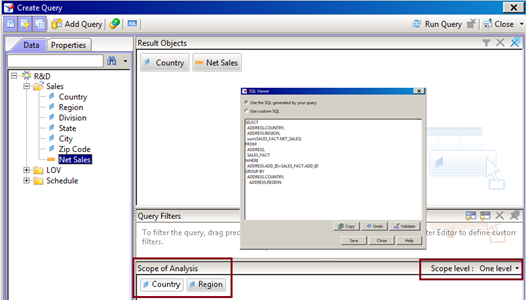 Even though we have not selected Region in the select, it is available in query and in left pane (data pane), Means by selecting scope of analysis, report brought the Region object also, when we ran the query for Country and Net Sales. Now, if we drill the report from Region to Country, report won’t hit database to get the required data. But if I try to drill further from Region to Division, it will hit the database to bring Division data. Basically Scope analysis helps in avoiding database hit for each time if you are drilling the report for analysis. To avoid each time database hit for your analysis and you can set the scope of analysis as “Custom” and add all the required objects in the query from that hierarchy into scope of analysis section and it won’t hit database for any level of drilling which will be stored in Webi microcube. Note: Desktop intelligence report will allow you to drill down till the level you have defined in scope of analysis and for rest of the level to drill, you have to right click on the column and use drill by whereas this is not the case with Web Intelligence reports. There is an Webi security rights for scope of analysis and you can setup the rights in CMC->Application->Webi then “Extend Scope of Analysis”. If you deny this access for particular user, that user cannot go beyond the specified scope of analysis for that particular report. For example, UserA having grand access for “Extend Scope of Analysis” and his report has defined scope of analysis as 1 level (considering the above example), even though he can drill the report from Region to Division by hitting database. Imagine another userB having denied access for “Extend Scope of Analysis” and he cannot drill from Region to Division. So by defining the access for “Extend Scope of Analysis”, you are actually allowing user to access only the levels you want him to drill down. Defining scope of analysis for hierarchy objects in the query for the levels you have specified and it won’t hit the database while drilling for each levels. If you are well known of the users requirement of a drilling for your report you can very well set this option in your report to avoid each time database hit for each level of drilling and it will save your report refresh time and also help users to get requested data faster and also will avoid database traffic. Nice Blog ! Now I got clear understanding. Are there are any disadvantages of scope of analysis? How many max levels can be defined in custom scope of analysis.